As more and more robots move into social settings, humans will be monitoring the external motion profile of counterparts in order to make judgments about the internal state of these counterparts. This means that generating motion with an understanding of how humans will interpret it is paramount. This paper investigates the connection between environmental context, stylized gaits, and perception via a model of affect parameterized by valence and arousal. The predictive model proposed indicates that, for the motion stimuli used, environmental context has a larger influence on valence and style of walking has a larger influence on arousal. This work expands on previous research in affect recognition by exploring the critical relationship between environmental context, stylized gait, and affective perception. 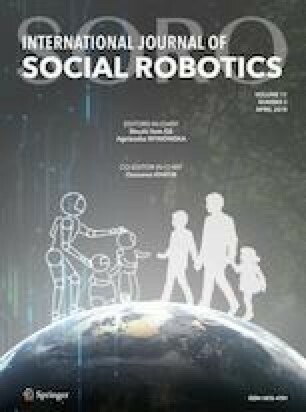 The results of this work indicate that social behavior of robots may be informed by environmental context for improved performance. This work was conducted under IRB #17697 supported by NSF Grants #1701295 and #1528036. Training activities funded by DARPA Grant #D16AP00001 and led by Catherine Maguire, Catie Cuan, and Riley Watts were critical to the paper. The authors also want to thank Lisa LaViers, a researcher in the Accounting Department at Emory University, for help in designing the implementation of the third study. A. LaViers owns stock in AE Machines, an automation software company. The demographics of participants across all three studies is provided here. These questions were asked so that more details about the diversity of the sample populations would be available to researchers conducting similar studies in the future (Tables 4, 5, 6, 7, 8, 9).